Rich gold and a subtle pattern beautifully decorate this classic soft bell lamp shade. From the Jiangsu collection by Springcrest Collection™, this soft bell lamp shade boasts a charming and subtle abstract pattern. 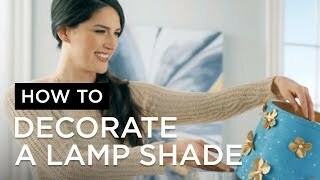 The shade offers a two-tone teal golden coloration that's soft and understated. Offering polyester fabric with a cotton and poly blend lining, this shade includes a polished brass finish spider fitter. 6" across the top x 12" across the bottom x 9" on the slant x 9" high overall. Soft bell lamp shade from Springcrest Collection™. Polyester fabric. Gold color tone abstract pattern. 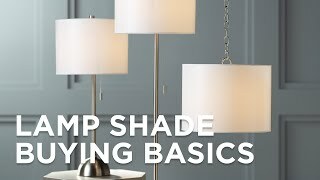 This shade is the perfect size for a smaller lamp. It is very well made, of a nice fabric, and reasonably priced. I didn't give it five stars because it is really too bright of a gold for any room in my house. A slightly darker - more orange or bronze - color would be more flexible; it's a personal preference, I know! A wide accent band highlights the contemporary flair of this rectangular gold lamp shade. Decorative gold trim adds stylish flair to complement this bell rectangular lamp shade in gray and gold. Bring an artful and elegant style to any lamp or lighting fixture with this cream fabric bell shade.